newspaper comic, The Lockhorns, and from then on, it was one daily after another, for the rest of his life. Agatha Crumm was his third, following Bumper Snickers (1974). Agatha may not have been as wealthy as Scrooge McDuck or Richie Rich, and maybe not even Rich Uncle Pennybags. But as owner of the Crumm Cookie Company, she was probably in the range of Mr. Abernathy, and that's about as wealthy as most toons need to be  even when they're financing a lifestyle like Rose Trellis's, which includes a lot of corporate wheeling and dealing. The seven-day comic strip where Agatha was introduced debuted from King Features Syndicate (Hagar the Horrible) on Monday, October 24, 1977. (A report elsewhere, that she'd begun exactly two months earlier, is apparently in error, as August 24, 1977 was a Wednesday.) She was old enough to rival Uncle Elby or Grandma, but spry, very active in the world of high-finance shenanigans. 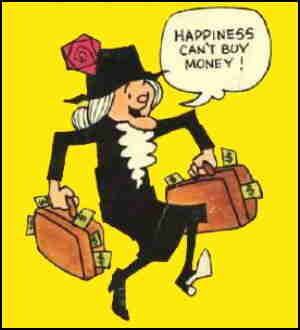 There was never a movie, TV series or even comic book about Agatha Crumb, but she was the subject of a few paperback reprints of her gag-a-day comic strip. Between 1980 and '83, Signet Books published three such collections. Hoest died in 1988, and his comic strips were continued by his wife, Bunny, as writer. John Reiner, Hoest's assistant, took over the art, and readers seldom if ever noticed the transition. They ended the comic in 1996. Text ©2009-11 Donald D. Markstein. Art © King Features.